The "Uspishna Kraina" party stated about human rights violations of Ukrainians in the European Parliament ⋆ News ⋆ Official website for Oleksandr Klymenko. 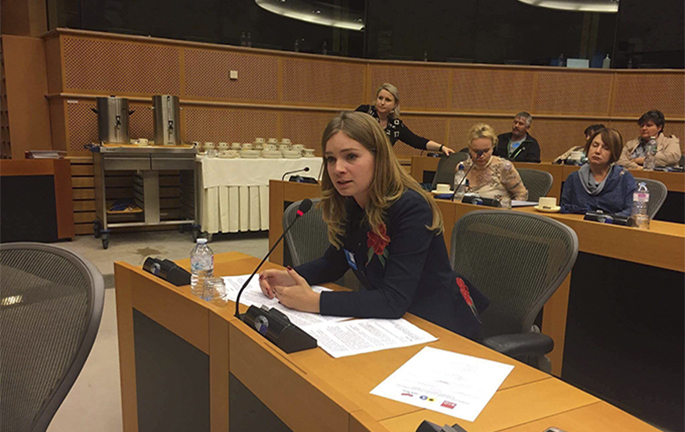 Olesya Medvedeva, member of political board of the “Uspishna Kraina” party and volunteer of the “Restoring Donbas” community initiative, presented a report on human rights violations in Ukraine in the European Parliament. On September 27, Olesya Medvedeva – member of political board of the “Uspishna Kraina“ party – was invited by MPs of the European Parliament. Thus, she visited the Brussels in order to take part in the roundtable “Violation of human rights, limits to freedom of speech and political repressions in Ukraine“. MEPs Jiri Mashtalka, Javier Couso Permuy (GUE / NGL), Tatjana Ždanoka (Greens / EFA) and Andrei Mamykin (S & D) became the organizers of the above-mentioned international event. During the roundtable, Medvedeva drew the European partners’ attention to real facts of violation of the IDP’s political rights. It comes about verification, inability to participate in elections, and bureaucratic obstacles to issue of biometric passports. “While Ukrainian leaders appeal to the world community in order to beg for money and weapons, the situation with observance of the internally displaced person’s rights in Ukraine is getting worse. In fact, millions of refugees from the East of Ukraine were turned into second–class citizens, aliens in their own country. This is the aim of information policy of the current regime in Ukraine. It is rather difficult to rent an apartment or get a job for IDPs due to the fact that media call them accomplices of terrorists. It offers to deprive such people of some civil rights. Creation of ghettos and concentration camps for dissentient Ukrainians have been seriously discussed on air of television channels, which are owned by the leaders of the country”, – Medvedeva noted during the debates. During the event, it was presented the monitoring of certain aspects of human rights violations in Ukraine, which was prepared by the Human Rights Group “Uspishna Varta”. This document persuaded European partners of deterioration of the situation related to social, democratic rights and freedoms in Ukraine. In particular, the monitoring of the “Uspishna Varta” includes proven facts of persecution for political reasons of Ukrainian citizens, preclusion of legal activities of political parties, restrictions on the right to assemble peacefully, etc. Particular emphasis is placed on political prisoners in Ukraine and prisoners of conscience. For instance, Denis Kindrat, who stored communist symbols and literature, journalists Dmitry Vasilets, Evgeniy Timonin, Vasil Muravitsky, who advocated for public criticism of current power in social networks, and others. Besides journalists, current government puts pressure on independent media, such as the “Vesti” radio station, the “Strana.ua” website, Inter and 112 TV channels.